> Knowledge base> Article: How do I correctly load the label stock to avoid feeding and printed image offset problems? Article # 207934 - How do I correctly load the label stock to avoid feeding and printed image offset problems? Incorrect loading of the label stock is the number one reason for horizontally or vertically offset images and a variety of other feeding problems. Below is a top view of the printer with the cover open. There are four main areas to watch for when loading label stock. See the graphic below for a brief overview. 1. Fixed Throat Guide. Make sure the label liner/backing is tight up against the left edge of the fixed throat guide. 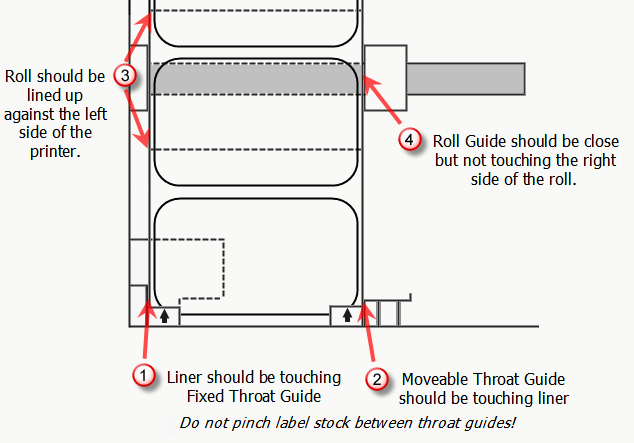 The throat guide causes the stock to feed straight so make sure the liner is touching this guide. If it is not touching it is possible for the label to "walk" back and forth between the throat guides. 2. Moveable Throat Guide. Make sure the Moveable Throat Guide is almost touching the right edge of the label liner/backing. It is also important to make sure the Moveable Throat Guide is not pinching the label stock. You'll notice a rough liner edging on the right side of the stock if the the label stock is pinched between the throat guides. 3. Roll tight against Printer. The left side of the roll should be tight up against the left side of the printer. If this is not tight, it will not matter if the the label is correctly fed in between the throat guides. The stock will be twisted as it comes off the roll causing feed problems. 4. Roll Guide. The Roll Guide should be flipped up and moved to the edge of the right side of the roll. It should not touch the roll. Some rolls may not be evenly rolled from the outer edge to the inner core. There may be some labels protruding near the core. Because of this it may be possible for the bottom of the roll to be touching the roll guide while the top is not. This can pinch the roll causing feed and offset problems. Make sure that no part of the roll guide is interfering with the label stock. Top View of the LX 800/810/900 printer with cover open.